At Sky Birds of Prey, we would like to make your wedding day one to remember. 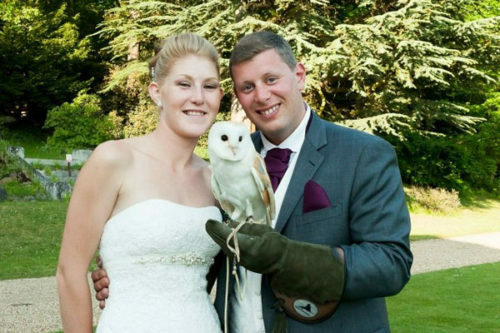 So why not surprise your guests or even your bride/Groom with an Owl delivering your rings to you at your ceremony. Once you have said your vows, you and your guest will head to the reception where we meet and greet your guest with a selection of Birds of Prey ranging from Hawks, Owls, Falcons and Eagles with the chance for the bride and groom to have photos with a few of our birds of Prey. Finishing up with an entertaining display with the option of participation. Once your Falconer releases the Owl, your guests will behold the stunning and soundless flight of the Barn Owl as it glides above their heads. Upon which, the receiver of the rings will be ready to land the Owl on a glove where you will find the rings attached via a ribbon on the Owls anklets. We can also have the ribbons matching the colour scheme of your special day! The meet and greet consists of a Static Display of the Birds of Prey, where you will have the chance to talk with the falconer about the Birds on display and what they are truly capable of. You and your guests also have the chance to hold one of our Birds with the additional option of a few photos. Finishing up with a unbelievable flying display by our team of falconers, you’ll see what these birds can do with an educational and entertaining talk for you and your guest with an abundance of audience participation where they can experience a Bird of Prey flying to them and landing on their falconry gauntlet. An extremely action-packed package for venues with a great outdoor space! Our wedding ring delivery service is extremely popular, and we are already taking bookings for the up-coming year in advance. Upon confirming your booking, we will arrange for you to meet our team of Falconers who will attend your big day. You will also have a chance to meet and hold some of our birds that will be attending your big day. We will then undertake a mandatory site visit to confirm that the location is suitable for flying your wedding rings down the aisle and then arrange for you to attend a rehearsal before your big day. Due to the nature of these we would need to tend to the pricing of these individually. So please contact us for further details……. By completing our requirments form we will be in contact with a quote tailor made to your requirements. We assure you, there will be a Sky Bird of Prey Display to suit you, your location and your budget!